Sandy Road, Scone, stone circle. Slide copy of publication drawing (for comparative plans): Inventory p. 32. On the E margin of Scone Wood are the remains of two circles of standing stones which have probably been tangential to one another. Because of forestry working, the eastern circle (B) is now almost totally destroyed. Three stones, measuring 2ft 10ins by 2ft 5ins by 1ft 3ins, 3ft 3ins by 3ft 2ins by 8ins, and 2ft 10ins by 1ft 9ins by 7ins from N - S lie more or less loose on the surface of the ground on what was probably the W arc of the E circle, but as the stones are no longer in situ, the true perimeter of this circule is not known. It is noticeable that two of the above stones are "keeled" and have associated stabilising faces in the same manner as in six of the seven stones of the W circle. There is also ample oral confirmation of the previous existence of the E circle. The western circle (A) consists of seven stones set on the perimeter of an area approximately 18ft in diameter, the largest stones being on the W and SW arc. It was excavated in 1961 by members of the Perth Society of Natural Science (photographs and dimensions of the stones are given by Stewart). It is suggested that the stone found between stones 6 and 7 on plan (q.v.) was that missing from socket 5. 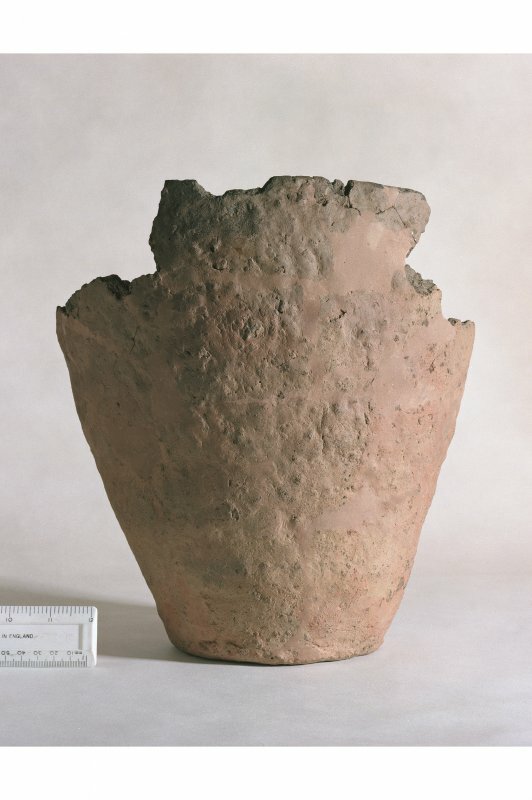 A Flat-Rim urn was found 2ft N of the centre of the circle. It had been placed mouth upwards and contained cremated bone and carbon. M E C Stewart 1961; 1965; F R Coles 1909. The remains of circle 'A' are generally as described. It comprises six rounded boulders, with another barely protruding from the ground. The three stones from circle 'B' lie immediately E. They all lie in the middle of a council housing estate in the course of construction. Visited by OS (W D J) 18 October 1963. These stones have been temporarily removed. There are seven stones, which have been numbered and are to be cemented in position. They are shown at 1/2500 in the positions in which they will be cemented. Visited by OS (C B) 7 April 1965. This stone circle stood on the W side of the village of New Scone until 1961, when it was excavated by Stewart (Stewart 1965) in advance of housing development. No trace of a second, tangential circle identified by Stewart is recorded by either the Ordnance Survey or Coles (Coles 1909), and she may have mistaken the character of some natural boulders. On completion of the excavation, the circle was re-erected and it now forms a landscaped feature within the housing complex. The circle comprised seven stones on an original internal diameter of about 5.4m; one stone on the NE had been moved since 1909 but its socket, and those of five other stones, were located by excavation. Many of the stones had been 'keeled' to aid their stability and they were graded with the largest stones on the W and SW arcs. An urn containing a token cremation had been set upright in a pit at about the centre of the circle. It measured 315mm in height by about 200mm in diameter at the rim and its contents provided a radio-carbon assay of 3150 +/- 150 bp (GaK-787). Visited by RCAHMS (JRS) 24 August 1989. NO 1327 2646 A watching brief was undertaken on 7 October 2009 during groundworks associated with the repair of communication equipment within the area of the scheduled stone circle. The excavations were within the ground disturbed during the insertion of the original services and no significant archaeological features or artefacts were recorded. An archaeological watching brief was undertaken by AOC Archaeology Group on ground within the Scheduled Ancient Monument of Grey Stanes Stone Circle, Scone. The work was undertaken to monitor the potential impact on the archaeological resource during groundwork associated with the repair of malfunctioning communications equipment within the former area of the Scheduled stone circle. All of the excavations undertaken were within ground previously disturbed during the insertion of the existing apparatus that was being replaced by these works. No features relating to the stone circle were identified and no other significant archaeological features or artefacts were recorded.